One of our balconies is located almost halfway Estafeta, which is the longest of the four streets involved in each run at 330 meters. Based on availability, we offer balcony only reservations at $145 USD per person. If you’re not on the street running with the bulls, this is one of the best seats in the house. 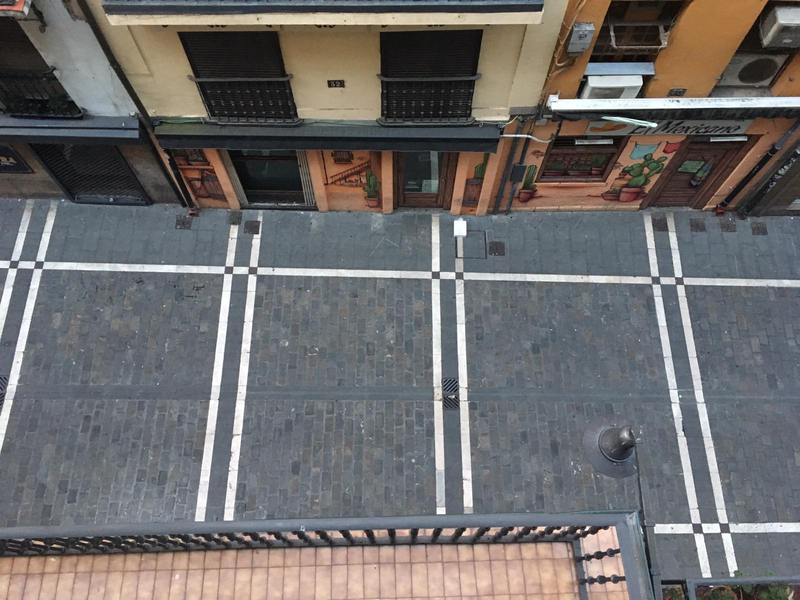 Since Estafeta is a straight street, the viewing from right to left is hard to beat. Watching from this height and this location will be among the longest available throughout the route. We are located on the 2nd viewing level of the building, the third floor from the street. Yes, there is a small traditional breakfast served each morning. We have an informational flyer with everything you need to know. You must enter before 7:00 am because the police close the street at this time. We strongly suggest you join our walking group each morning at our hotel to ensure reaching the hotel without any issues. Since we are charged by the head, there is not a discount for children. Thank you all for such a great experience. And for my first trip overseas, I felt I picked the right group of people to guide me. My husband and I ran with the bulls on 7/8/18 and we could not have done it without Toby and his team! Toby is such a cool guy! Very knowledgeable and very easy to be with! They really went above and beyond to give us a once in a lifetime experience! Totally worth every penny we paid for! I HIGHLY recommend Toby and his team for unforgettable once in a lifetime experience! A HUGE thank you to Toby & Rich (& all the ladies) from bucket list events... these guys made our run with the bulls experience run so very smoothly..you guys went above & beyond to provide an AWESOME experience.. we had such a blast along the way..meeting beautiful people who loved life . it was a blast meeting you all!!... ???‍♂️?‍♀️?????? Showed great interest in what they were doing & a very fun, personable group! Definitely helped ease the stress of possible goring hahaha! Did take their advice, ran with it & survived ?? Definitely plan on doing Pamplona again! Thanks for a great time Toby & team! Not usually one for organized tour types of things I went against my nature and reached out to Toby for one of the stops on a trip I was taking with my son for his graduation. The main event of the trip was Pamplona and the run. This turned out to be a great decision as the convenience and knowledge that came with Toby and the rest of the team at BucketList Events made the trip all that much better. I can not recommend this event and this team enough. Thanks for your attention and making this a great lifetime memory. 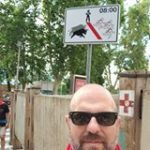 The event of the Running of the Bulls in Pamplona, Spain has been on my Bucket List, since I was stationed in Sarajevo, Bosnia back in 1998. Due to timing problems, I never made it to the event. Then I found BuckListEvents com on line, and after doing some research, I signed up with them. What a great decision on my part. 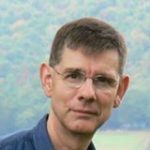 Toby Akins, and his great team organized the whole experience for me (and the others who signed up). I have to admit that I was apprehensive about getting down on the street and actual running with live bulls. Here is how Toby arranges the experience. 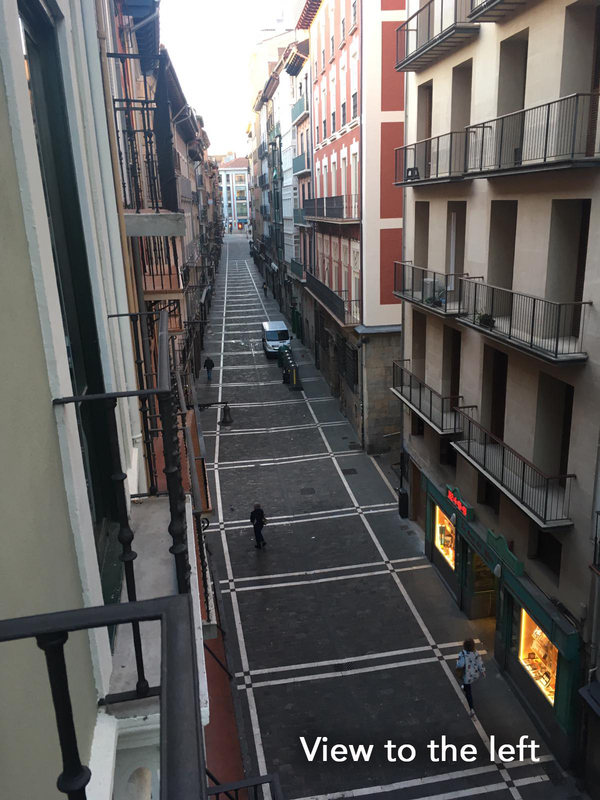 I arrived at the hotel in the morning, and I had until 3pm to walk around and sight see Pamplona. 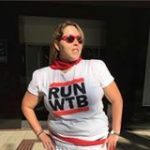 At 3pm, I was met in the hotel lobby by the guides (who warmly introduced themselves to me), and given my packet (including my cool Run with the Bulls t-shirt). 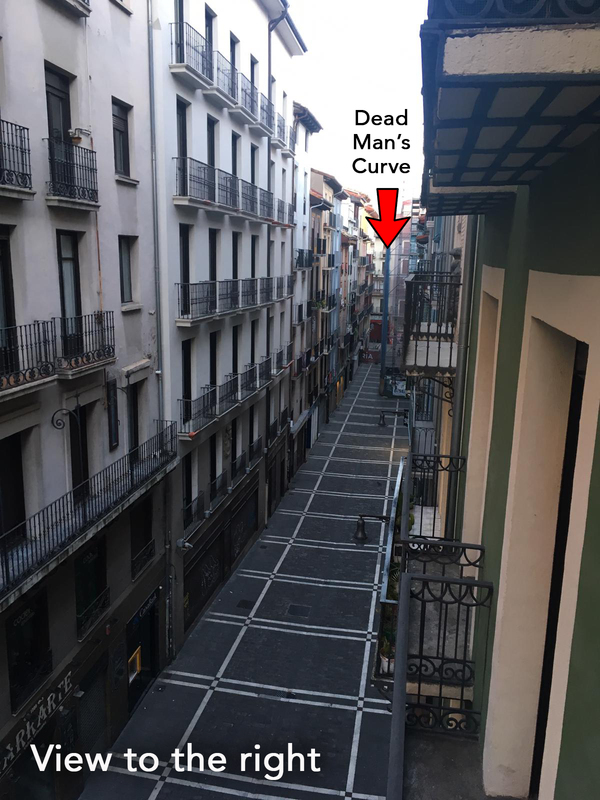 At 6am the next morning, we walked to an apartment overlooking the street where the bulls ran each morning. So, I got to see from above what the actual run looked like. There were other guests in the apartment, who had been there before the previous morning. Today, they were running. Today, I was observing. After the run, some of the runners came back up, and we were able to discuss their experiences, and I picked up some tips. That afternoon, Toby, and some of the guides took us on the walk of the entire run that had been held each morning. I got to view what it looked like from the street view. The next morning, we were again escorted back to the apartment, and at 7:50am, I walked down the stairs from the apartment, and out unto the road. The rocket sounded at 8:00, and a wall of runners started coming down from the direction of the bulls. I started running, whooping it up with the other runners. Soon the bulls were running past, and then they disappeared towards the bull arena. It is a fast experience. What a rush. Toby and his team make all the arrangements, and we just have to show up to-participate and enjoy. It is a truly professional and well-coordinated endeavor. The entire experience exceeded my expectations. Thank you Toby and Kasey, Kelly, Thecla, LeRae, Fatima and Adrienne for making our trip to Pamplona one worthy of going into the record books. Once again Toby and his team absolutely delivered an unforgettable experience. This is the second time we have used this organization and they continue to impress. My friends and I had the pleasure of experiencing the Running of the Bulls festival with Bucket List Events this year and I would easily do it again. The festival itself is such an amazing time, with the whole town constantly buzzing with high energy and good times. If anyone is thinking of going, please go-go as soon as you can, and when you do use Bucket List Events. They had access to some of the best viewing points of the bull runs and arranged the most fun activities in the evenings. Besides the festival what made this trip an amazing time was the relentless attention to detail and service provided by Toby and his staff. They are all friendly and helpful and they make you feel like you're on vacation with old friends. They make themselves available day or night and they go above and beyond any expectations you might have. In addition to Toby- who is fantastic, we spent a lot of time with Casey, Kelly, and Techla. Words can't justify how much fun we had with these ladies, what a great crew. Fatima, Adrien, and LaRae are also so friendly and helpful to any and everything you need. I could go on all day about what a great time with had with everyone, so if you have a chance to have a Bucket List Events experience-take it. Thanks again Toby and the crew! The Pamplona Bucket List Event experience was fantastic from start to finish. Starting months before Toby sent information and guides to help you plan, prepare, and of the history of the San Fermin Festival. The hotel in Pamplona was very comfortable and the away from the craziness going on in the Plaza. We were greeted immediately by friendly enthusiastic people. Our schedule was perfect allowing plenty of free time. The staff was awesome!!! They even found out where we could buy a replacement suitcase for our son as well as bringing him ice packs after he had a “run in” with a bull after his second run that week. Even though we booked the midweek experience for Pamplona there were people who only had a day or two weaving in and out throughout the week. I was impressed with how Bucket List Event’s was able accommodate them and to give them a full experience. Toby, you are awesome! We loved your humor and wealth of information, some even useful. :-p Thank you and Kasey, Kelly, Thecla, LeRae, Fatima and Adrienne for making our trip to Pamplona one worthy of going into the record books.